A review of "The Encyclopedia of New and Rediscovered Animals"
This is a new edition of “The Lost Ark”, an earlier work by the same author. Karl Shuker is a prominent British crypto-zoologist who authored a long string of books. His website also contains interesting material. Despite its name, this is not a typical encyclopedia with topics ranging from A to Z. Rather, it's divided chronologically and biologically. Each chapter deals with a specific group of animals (such as mammals or birds) with those discovered earliest placed first. The animals covered were all discovered (or “discovered”) by modern science during the 20th century. For information on more recent, 21st century, finds you have to consult a special chapter! Luckily, there is an index in the back of the book. 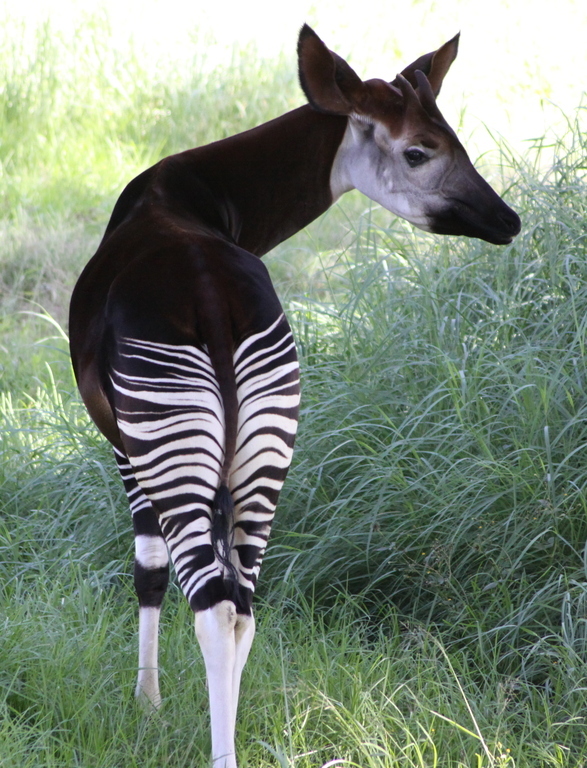 Some animals covered are well-known, even world famous, such as the okapi, the giant panda, the mountain gorilla, the ivory-billed woodpecker and the coelacanth. Others are less known (at least to me! ), such as the North American sea mink (a large mink hunted to extinction before it was properly described by science), Kellas cat (a feline hybrid from Scotland first assumed to be a new species), or the Congo Peacock (yes, an African cousin to the Indian ditto). Since the book is written by a crypto-zoologist, it also includes a short chapter on spectacular cryptids such as the Yeti and Bigfoot, and some entries straddling the fence between crypto-zoology and “real” science, such as the piece on the Onza, Mexico's elusive ersatz Cougar. I was fascinated by the entries on the Pseudonovibos and the Andean Wolf. Clearly, there is still much to discover out there! And of course, that is the real point of this zoological extravaganza: to propagate crypto-zoology, regarded as “pseudo-science” by the skeptical faithful and as unabashedly Fortean by the Forteans. If relatively large animals are still being discovered, perhaps the elusive beasts of Forteana (such as Bigfoot, Nessie or Mokele-Mbembe) are still out there? I wouldn't mind, in fact I'm probably even more “woke” than Shuker on some issues, but if you are a skeptic, you might find the crypto-angle of this volume somewhat annoying. Should it be placed on the science shelf in the library, or in the same section as books on homeopathy, Theosophy and Atlantis Rising? In a book this size, factual errors inevitably sneak in. I discovered two: Egypt's jackal is said to be the only wolf native to Africa (p. 289), suggesting that Shuker doesn't know the rare Ethiopian Wolf (strange in itself!) and crows are said not to have helpers-at-the-nest (p. 125), while my understanding is that they do. Nevertheless, I think this excellent volume nevertheless deserves…five stars!